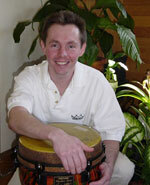 John Yost is a master facilitator, rhythmatist and educator. John has performed, recorded and presented internationally. He has studied in Africa, Japan, and in the USA with master drummers and facilitators. John is degreed in Percussion from Northeastern University in Illinois (1992) and obtained certification from Northwestern University in Leadership (2013). John has facilitated interactive music making activities and drum circles for conferences, corporations, schools, community groups and at major events worldwide. He is a leader and performer in both Primitive- world music group and Kaiju Daiko and has consulted as an entertainment coordinator on world class events. 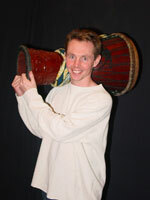 He teaches ongoing West African drum classes, Japanese Taiko classes and facilitates a monthly community drum circle. John is also the author of a best selling instructional video series entitled “John Yost teaches”. John is a member of the Drum Circle Facilitators Guild, is on the board of the Interactive Drumming Committee for the Percussive Arts Society, is and adjunct professor at Vandercook College of Music and is a Remo and Boomwhacker endorsed facilitator. John is also a Certified Parks and Recreation Professional by the National Recreation and Parks Association. To contact John directly please see our contact us page.